Wide receiver Zavier Betts of Bellevue West eyes an incoming pass during a drill at a Friday Night Lights camp at Memorial Stadium last summer. Betts has offers from both Nebraska and Iowa. Zavier Betts was standing on the sideline Wednesday morning at Nebraska's practice when Husker offensive coordinator Troy Walters came over and said hello. They're going to be seeing a lot more of each other, apparently. 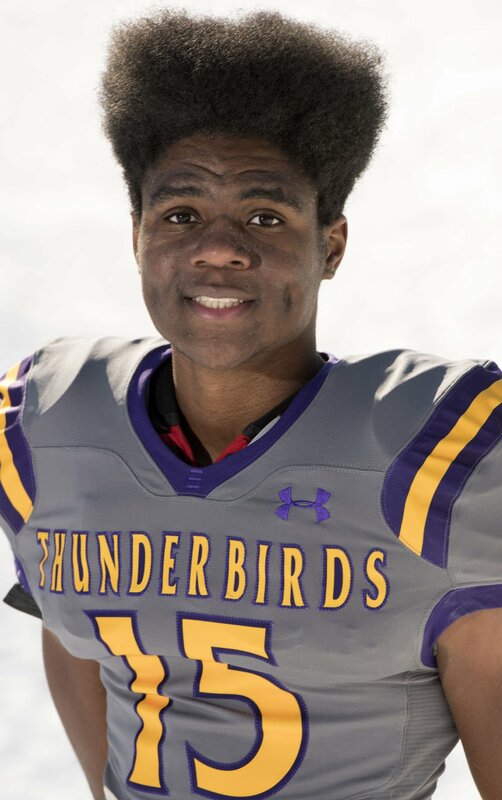 Betts, the four-star receiver from Bellevue West, gave his verbal commitment to the Huskers after practice and announced the move on Twitter shortly after. "Just watching them compete to get better and to make each other better and their drive to compete and rebuild the program, I wanted to be a part of that," Betts told the Journal Star. After practice, he walked off with Walters and some others and waited for coach Scott Frost, lingering in front of NU's national championship trophies, which are on display in the football offices. Then, Frost came up to his office and he delivered the news. "He was very, very excited," Betts said. Betts called Bellevue West coach Michael Huffman while practice was going on and said he decided to give his verbal commitment. "I'm excited for him, man," Huffman said. "I've only had the chance to visit with Coach Frost a couple of times since he took the job, but man, Barrett Ruud is fantastic at what he does." Ruud, a Lincoln Southeast graduate, coordinates NU's in-state recruiting in addition to coaching inside linebackers. Betts was one of the most sought-after prospects in the state for the 2020 cycle. He earned first-team Super-State honors from the Journal Star for a junior season that included more than 800 receiving yards and 12 touchdowns. The 6-foot-2, 190-pounder is the second verbal commitment for the Huskers' 2020 class, joining quarterback Logan Smothers (Athens, Alabama). In becoming a consensus four-star talent — ranked the No. 46 overall player in the nation by Rivals and a top-100 player nationally by the 247Sports Composite — Betts has become one of the most feared players in the state. Defenses regularly tilted their attention heavily toward him during his junior year. "There were a couple of teams that did not cheat his way, and boy, did he make them pay," Huffman said. Even with the added attention, he averaged 17.8 yards per catch and scored on a quarter of his receptions. "Honestly, I tried not to think about it very much," Betts said of his status as a top-shelf recruit. "There were a few times where I saw something change and I'd tell my mom and we'd kind of freak out for a few seconds and then just let it go and I'd go back to being just normal. "I didn't want to be 'Zavier Betts, the No. 1 receiver in the state.' I wanted to just be Zavier and just be me and not worry about anything else. That's why I was so quiet through recruiting and everything." Huffman also made no bones about the fact that Betts still has work to do in the classroom, but said the receiver is handling it well right now. While his recruitment was quiet from the outside, he did spend significant time around this program after Frost and company took over. He attended Nebraska's Friday Night Lights Camp last summer. He came to multiple home games during the 2018 season. He's been on several unofficial visits. "Just being up there so many times and being able to watch their practices and seeing what they do behind the scenes on game days," Betts said of what he's learned about the program. "They were in constant contact. I had Coach (Barrett) Ruud, Coach Frost and Coach Troy texting me regularly." Now he's an early part of Nebraska's class. Next on the list is to help peer recruit. And he's got a specific in-state mate in mind: The only other player for 2020 in-state that currently holds an offer. "I was actually talking to (freshman tight end) Chris Hickman about getting Xavier Watts to Nebraska, as well," Betts said of the Super-State receiver who's also got offers from Michigan, Wisconsin, Notre Dame and a raft of others.